Killer Characters: Snowshoeing Can be Dangerous! August 6: Judy is the randomly selected winner! Congratulations. And thanks to everyone for entering! students from Indiana University. We stopped into Pans 'N Pancakes, her country store restaurant, and the rest is history. I helped her find her Italian dad, and in Maddie Day's next book, When the Grits Hit the Fan, she helps clear my name of murder! That's what friendship is all about. It all started at one of our Sociology Department Friday night winter dinners in Robbie's store. A prof in the department is a pretty unpleasant guy, but when Robbie and I went snowshoeing the next morning, we sure as heck didn't expect to find him dead. And then...well, I'll let you read the story yourself next February. But in the meantime, Maddie is giving away a copy of the first two books, Flipped for Murder and Grilled for Murder to one commenter here. Ask the author a question - any question! before August 5 at midnight, and you'll be entered in the drawing. Be sure to indicate your email address so she can find you. Edith Maxwell writes the Quaker Midwife Mysteries and the Local Foods Mysteries, the Country Store Mysteries (as Maddie Day), and award-winning short crime fiction. Her short story, “A Questionable Death,” was nominated for a 2016 Agatha Award for Best Short Story. Yes, you may, Carol. I didn't restrict the giveaway to US only. The postage is a little more, but I like to spread the love around! You might be onto something, Grace! It's a tossup between cooking, gardening, and reading! I was reading primarily cozy mysteries written by women with a female amateur sleuth. Decided to see if I could write one! Maddie, I love the clever titles in this series. Is that something you have input on as an author? Thanks for the chance to win! It definitely is. But I'm not that good at titles, so I tend to crowd-source them. Book four will be Biscuits and Slashed Browns! Briefly, I used to live in that part of Indiana and had friends who had rehabbed an old general store into a bed and breakfast. Bingo! The idea was born. Sometimes the artists come through with my vision, sometimes they don't! But Kensington does not pass a draft by me. First one was really good, very anxious to read the second and upcoming release - even if guys never do win these things! dsareboot (at) gmail! Do you have a hard time deciding what your next book is going to be about? Not hard, really, Judy, although I do have to noodle it around some. Country Store #4 is anchored to the real National Maple Syrup Festival in Brown County, Indiana in March - so then I came up with a victim and suspects connected that! I'm just trying to keep up with the extreme sport of writing three bestselling mysteries a year. That's enough for me. Depends on the book, Debby. For this series I visit the area once a year and listen to the local dialect. I always am checking out new poisons, reading about breakfast foods, talking to small restaurant owners. But my historical Quaker Midwife Mysteries are another research department altogether! books? I love your Quaker Midwife Mysteries and I'm sure I will enjoy this series too. Thanks, Robin. Not sure about odd, but scariest might be that two of those vials of liquid nicotine that you can buy ANYWHERE for vaping can kill an adult. Seriously! I am always trying to deepen my story and characters in the way that Julia Spencer-Fleming and Louise Penny write. Gorgeous writing, incredible storytelling. Do you outline or are you a pantzer? I am always trying to outline but I have a hard time in my own writing. Generally a pantser, but have been known to plot ahead a few scenes. That's WAY to hard to answer! I have lived all over the world: Brazil, Japan, France, Mali, Burkina Faso. Right now I'm looking forward to a vacation in Maine next week. Have you done any snowshoeing yourself? I think it looks like fun, but I'm probably to uncoordinated to do it. Thanks for the contest. I have, but you have to have strong thighs and flexible knees! Are you from Indiana? I am. From a small town in Southern Indiana called Huntingburg. No, but my father and all his ancestors were, right back to the founder of Indiana University, my g-g-g grandfather - and I earned a PhD there in the early 80s! Dorothy L Sayers is a favorite. I'm not that good at titles, so I tend to crowd-source them. Book four will be Biscuits and Slashed Browns! I love the series (borrowed from library) and would really like to own them. I haven't read any of your books yet, but I would like to ask if you like to put animals like cats or dogs into your stories? I noticed a cat on the cover on the book above. lclee59 at centurylink dot net. Every series has a cat, and my real-life Birdy is the kittie in this series! What do you think you would be doing today if you had not become a writer? I'd still be writing software manuals. I've always been a writer of some kind or another. It's what I like to read! Grateful readers, my imagination, my three multi-book contracts (that is, panic...). I seriously love the title of this book!!! Thanks for the chance to win, I've not read your books yet. I love them. Usually the title comes later. I would love to read your books. They sound like something I would really like! Multiple series and author names. How do you keep it all straight?! I try to work on only one series at a time. And my characters are all so real to me, I really don't get confused. Research is mostly time consuming with my historical series. And I love grits! I started reading cozies in the eighties. I read suspense and traditional mysteries, including police procedurals, but not thrillers. Have you ever gone snowshoeing? You are always welcome to visit Buffalo in the winter; I have an extra pair for you! I have, but not in the last couple of years. Thanks for the offer! I always have more than one story in my mind, and my favorite part of writing is when a character does something I had NO idea she was going to do, no idea why - and I wrote! I have to keep typing to discover what comes next. Oh my gosh I just love this series and this is a gotta read for me that is for sure! ptclayton2@aol.com I sure hope that it is in print. The prize is in print - as are the books! I have never read your books before..sorry..what is is it that makes your cozy different from others? 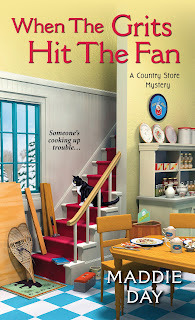 The Country Store mysteries are different in that they're set in southern Indiana in a country store breakfast and lunch restaurant. The stories are smart and funny and a good suspenseful read, according to reviewers! What is your favorite genre to read (next to mysteries of course)? I read some "women's fiction" - that basically are good stories with women at their core, but aren't necessarily mysteries. I'm totally a leisure on-the-flat rider. But my younger son thinks nothing of suiting up and going for a fifty-mile ride, so he was my consultant for the cycling part of these books. Really, any of the Wicked Cozy Authors are my favorites: Julianne Holmes, Jessie Crockett, Barb Ross, Sherry Harris, and Liz Mugavero. Try them! And stop by our blog (https://wickedcozyauthors.com/) any weekday for mystery with a New England accent. Paper, but when I'm traveling, I'm grateful I can bring twenty books on my Kindle! Thanks! Yes, Birdy is my junior cat. Preston is our cat who stars in my Local Foods Mysteries. And Christabel is our girl, who will make her debut in the second Quaker Midwife mystery next April! Do you have a favorite character from any of your series? Thank you for the chance to win. 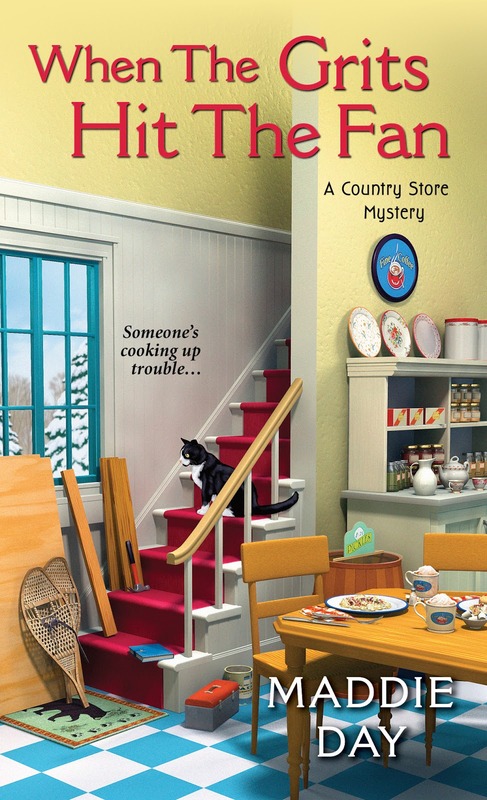 I'm quite fond of Aunt Adele in the Country Store Mysteries. She's tough, caring, and fun. Is there any character in your books that you find yourself relating to more than others? I only started reading cozies less than a year ago, so I haven't gotten around to a lot of different series, but yours looks like one I would enjoy. Thank you for the chance to win. You are welcome. All my protagonists have parts of me in them - but so do lots of other characters! Have you ever come across someone reading your books unexpectedly? Or see them purchasing them in a bookstore? I've had people I don't know send me pictures of my books from the New Arrivals table at their library, or the Barnes and Noble Cozy Mystery section. That's a big thrill. You write three series, do you finish one book before you start one in a different series, or do you have other books being written at the same time? If so, how do you keep track of the storyline and the people? I Enjoy your books, thanks for the chance. I try to work on one book at a time, but the characters are so real to me I don't get them mixed up. Happily anticipating the next book, and now thinking about snowshoes. I believe I tried them once when I lived in Minnesota, and they were HARD, trickier than Nordic skiing even. How do you manage them? Almost none - except Great Uncle Albert's new girlfriend in the Local Foods Mysteries (starting at Farmed and Dangerous) - she is my late mother, who died six months before my first book came out. I love remembering her in those stories. From an old lady - I love your hair style! And your books!! Hi there Edith/Maddie! Love this series & I'm hungry for more! If you could stage a book series in any country other than the great U.S.A., what country would that be? Thanks for a chance at winning! I have lived in Brazil, Japan, France, Mali, and Burkina Faso, and visited Canada many times. So many ideas, so little time! Thanks, Kelly. Some come from phrases I've overheard, some from my Hoosier sister, and some from other Indiana friends, and some from a couple of online sites citing colorful southern phrases! Thanks. Title a lot, cover a little at the beginning, but no chance to change once it's done, at least with me at Kensington. How do you pick the shops and "crafty" settings for your books? I follow the old, "Write What You Know" adage! I have, and I tried to capture that in the book! What comes first; the story-line or the characters? In a series, the characters. Looking forward to reading your latest release. Congratulations. I bought the first book in your LOCAL Foods mystery series and it was great. I also love the cover of this release which would definitely be a book that would catch my eye in a bookstore. Thank you for the giveaway. Will keep my fingers crossed. My comment was posted but I forgot to ask my question. Do you or other authors design your own book covers? Thanks, Patty. My publisher wanted two different names. So - voila! Thanks! For the first book in a series, I usually solicit cover blurbs. But the publisher also gleans critical reviews and other glowing endorsements. I'm lucky to have a lot of them. I am always fascinated by how an author fell into writing as a career. Did you set out to be an author? I've been writing my whole life, but didn't start writing fiction seriously until about 1994. And then, yes - my goal was to become a published author with reader who love my stories. It took a little while, but it worked! Apologies if someone already asked this, but I can't scroll through all these questions at work. Did you live in Indiana? I used to live in Northwest Indiana and my cousin went to IU. I'll have to add this to my TBR pile. Yes. My father and all his ancestors were, right back to the founder of Indiana University, my g-g-g grandfather - and I earned a PhD in Blomington in the early 80s! Judy, you are the randomly selected winner! Congratulations. Check your email for a message from me. And thanks for entering! I'm always looking for new authors and series to read. That's a big question, Brittany. I'd say start with a recipe you like, and then vary it. Use local produce in season, or change up the seasonings. It's a start! What are your favorite cozy series? I was also going to ask about your hobbies, but I see you mentioned cooking, reading, and gardening. Any others? I wish I had time to get back to quilting, which I've done some of. My mom was a master quilter! Thanks! I have had such vivid dreams (like the murder of the princess of Norway) I think I should write them down into stories- but they are never set in my books. Sue, they are set in fictional South Lick in Brown County, just to the east of Bloomington. I got a PhD from IU - and my g-g-g grandfather founded the school! So the area was an easy choice. What is the most exotic place you have used as a background for you one of your stories.? They are all so real to me it really isn't a problem, Kay. Do you find it easier to write contemporary stories or historicals? They both seem to come fairly easily to me. What is more challenging for you-- writing or editing your first draft? I love editing, but making the whole plot work, especially when I'm halfway or two-thirds the way through a first draft is always tricky. Edith, How long have you been writing, professionally? Trick question! I've been paid for my non-fiction writing since about 1992 but was writing pieces before that, and lots of academic articles even prior. I sold my first short story for a very small sum in 2004 (I won a local fiction contest when I was 9 and was paid $2! ), and my first four mystery novels in 2012, so I guess you can say four years. I left the day job three years ago. All of your series seem different, but somehow enjoyable in the same way. Is one of them your favorite? Thanks for the giveaway. Thanks so much, Sally. I really can't say - I like them all in their own way! Wow! 157 comments! Looks like I'm in good company. I'd love copies of your books. What made you want to write about a country store mystery? I thought it would appeal to a wide audience, Kiki - and it has! Judy Tucker is our the randomly selected winner! Congratulations. And thanks to everyone for entering! I hope you can, Jill!